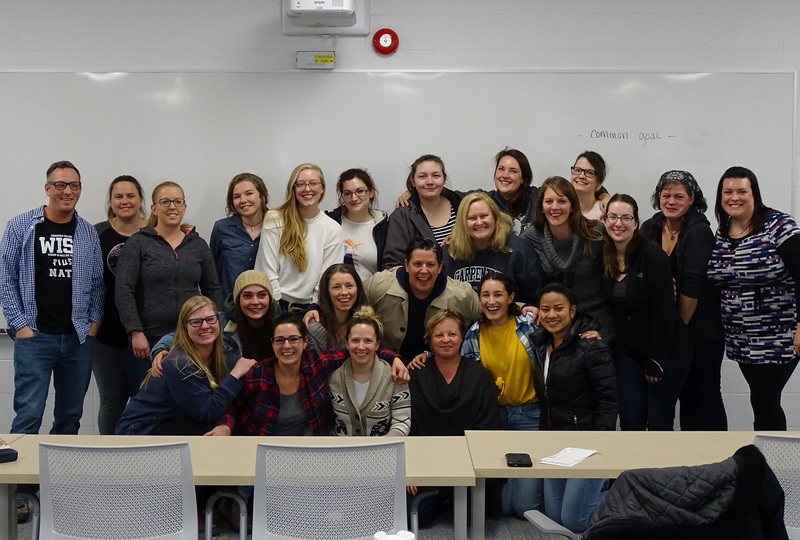 On November 28, students in Conestoga’s Women in Skilled Trades (WIST) program received a special visit from retail construction and maintenance magnate Mandy Rennehan, founder and CEO of Freshco, who presented each of the women with a $500 cheque. Mandy Rennehan, founder and CEO of Freschco, presented each of Conestoga's WIST students with a $500 cheque during a surprise visit on November 20. Known as the Blue-Collar CEO, Rennehan is an advocate of the trades and women in the trades, and speaks widely on the topic of the skilled trades shortage in Canada. Over the last few months she has received the 2018 Business Leader award from the Toronto Region Board of Trade, was named one of the top 25 Women of Influence for 2018, and was inducted into the Women’s Executive Network’s hall of fame after receiving its Top 100 award for the fourth time. Freshco is now Canada’s number one full-service, reconstruction and retail maintenance provider with full coverage across Canada and the eastern United States with a client list that includes global retail brands like Apple, Gap, Nike and Tiffany & Co. Approximately 60 per cent of its staff is comprised of women - including four WIST graduates - and that’s because Rennehan said she has always seen the true value of the potential of women. Bethany Davis said she’s known of the WIST program for a while, but finally decided to enrol this year and is happy she did. She said she’s working with a great group of women, and is also appreciative of the Freshco gift: “This money will allow me to do a little more for Christmas. I’m a single mom so it will help immensely." Davis may also put the money towards a new drill for herself. The gifts from Rennehan are part of a partnership agreement between Freshco and Conestoga to help students subsidize their living expenses. Freshco has also directed additional support to the college’s Trades & Apprenticeship program, and Rennehan and her team visit the college often to mentor WIST students and participate in Conestoga's Jill of All Trades and Trades and Technology events which allow young women in high school to explore careers in the trades. WIST is a tuition-free program funded by the provincial government to support low-income women who are unemployed or underemployed prepare for careers within the construction sector as a general carpenter with the basic skills required to secure a position as an apprentice. The 34-week program includes 26 weeks of in-class practical theory and hands-on experience, and includes a paid eight-week work placement. Applications for the next delivery of the program will open in March 2019. Visit the School of Trades & Apprenticeship or email ETT4W to learn more about women in trades.